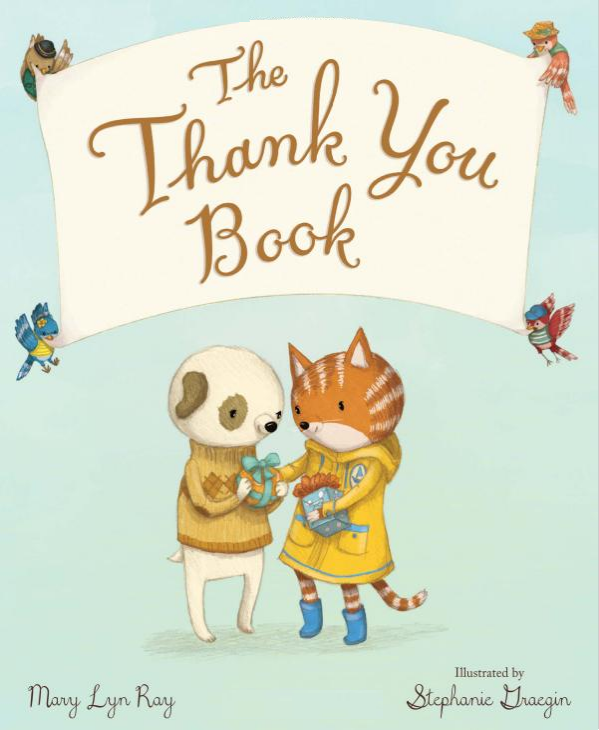 The Thank You Book written by Mary Lyn Ray and illustrated by Stephanie Graegin is a lovely book full of an abundance of things to be thankful for, both big and small. Children will experience the examples lyrically brought forward to their ears and charmingly-illustrated for their eyes. The illustrations include children, adults and animal characters holding hands, feeling the grass between their toes and eating together at the family dinner table. Two exceptionally-detailed illustrations depict the joys of playing in a tree house with entrance and exit of ladder and slide and marching in a parade with banners waving messages of peace, kindness and love. Birds, butterflies, ducklings, bees, dogs, cats and a hedgehog all play a role in this visual sonnet. Humor is also a part of this book. The author suggests a thank you for “zippers that zip jackets when warm days turn cold” and the illustrator cooperates with a picture of the little white dog, having put on his glasses, helping the little stripped cat zip up a coat. ( Houghton Mifflin Harcourt, 2018). Study the illustration that shows animals and children at a birthday party and answer the following questions. Who is the birthday party for and how old will he be? Give him a name. Can you find the seven presents he will open? Look very closely. What could possibly be in the present with a ribbon held by the bear? Make a guess. What kind of birthday cake could this be? Use your imagination. What kind of birthday cake is your favorite and why? Which little animal trips and falls down in this book? Who helps him up? How does the helper make the little animal feel all better? Have you ever had a fall and had a kind person help you feel better? Draw a picture of your experience and give it to that person as a thank you. This story and the illustrations go through all of the seasons and remind the reader that each season holds many opportunities, both big and small, to give a thank you. What are the things you are thankful for in the Spring, Summer, Fall and Winter? Make a list and decorate it. Have fun!